Alphabet? Really? I looked at the calendar. No April. Google is always good for a surprise. But this is huge! One deep breath... So what is Alphabet? Screenshot from Website above © by Alphabet Inc. All rights reserved. A holding that will include subsidiaries and making Google Inc. one of those, is a brilliant move to tackle some of the biggest problem that Google now has. The company is constantly under attack in Europe for having too much power. Google Search has over 90% market share in Europe at the time. YouTube is a huge success, and Android has more than 70% worldwide market share. With that numbers it is frightening how successful Google is. A good move to split things, before regulators will force them to do so under their conditions and ruining everything. 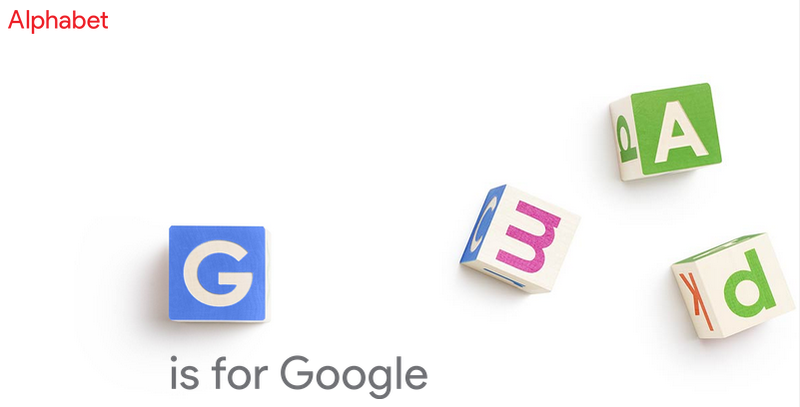 "Alphabet Inc. will replace Google Inc. as the publicly-traded entity and all shares of Google will automatically convert into the same number of shares of Alphabet, with all of the same rights. Google will become a wholly-owned subsidiary of Alphabet." This came completely surprising. Maybe the media were too busy talking about the upcoming death of Google+ and miss the big picture. It wasn't Google+ alone that faces and will face changes, Google itself will be "slightly slimmed down" and live under the new brand. The shareholders are pleased by that move. No wonder here, as they were always nervous with the many side-projects. Now they can act independently, bought, sold or shut down much more easily and with less risk for the shareholders. And hopefully...as a result of all this, improving the lives of as many people as we can." There you have it. Google keeps being fresh and agile moving before they must and keeps the momentum. Now we can only hope that this will continue under the new company Alphabet. I know all the whining about when Google shuts down a service. But that is what you need to do if you want to survive for the future, in a business that can change overnight. We had a lot of examples in the last decades when "old" companies lost all their drive, ending up in ruins from a leading position, because they miss the change.